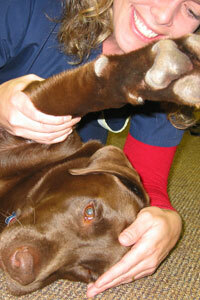 Blog - Answering questions & providing information about canine rehab and physio for your pet! Today I had a client show me the braces she had made for her dog’s hocks (ankle joints). Nice braces. Made by a company we use. But in this case, she had her vet measure and order them. It took her vet 1 hour to measure for the braces!!! (P.S. That’s a ridiculous long amount of time to just measure.) When I asked her why she didn’t get us to do it, she said, I didn’t know you did that. And furthermore, she said, you should really let people know! Well, indeed, that’s on me! So, I’m letting you know about some of the other services we offer. We can measure and order custom braces. Soft neoprene braces for wrists and carpal joints. We like to go through a company called Therapaw. They have a Canadian manufacturer who is also a physical therapist in canine rehab (and who has spent time with us at The Canine Fitness Centre as well). If it’s something simple, we can make a brace or wrap (more for a carpus… they’re easier). In fact, we hosted a course at The Canine Fitness Centre about three years ago. We brought up the owner of Therapaw, and she taught a group of 16 of us how to make simple soft braces, and provided additional information on what other assistive devices were currently on the market for purchase. This was a really fun class. And more importantly it led to us having two cabinets filled with custom orthosis & bracing materials. If you dog has greater instability (i.e. a full cruciate tear in his or her knee), or maybe an unstable ankle or wrist, or even an elbow, then we can do a casting of your dog’s leg in order to get a hard brace made. These are similar to a brace you might get after you had a knee surgery or injury. We send the cast down to a company in the US. Currently, we are using a company called Hero. The owner is a certified orthotist-prosthetist and also an amputee. So, her really knows his stuff! His braces might be an option for your dog! We’ve also fitted and ordered various other braces for clients depending upon their dog’s specific needs, and we actually carry a handful of over-the counter braces too. Just talk to us about your concerns, we’d be happy to discuss options. If your dog was ever taking into the exercise room, you’d have seen our wheelchair wall. This wall is lined with wheel chairs we’ve purchased or those that were donated to us. We can test / trial dogs in them to see if a wheelchair might be a good mobility aid. We can rent them out for a short period of time. In some cases, they can be purchased for a small fee. The thing about wheelchairs is that the fit needs to be right! So, if any of our wheelchairs don’t work or don’t fit your dog, then we can help do the measurements and order a custom wheelchair for your dog. Firstly, the right brand of wheelchair makes all the difference. There are about 3 manufacturers that we recommend (each one is has their own pluses and minuses… so you want to know who is good with what kind of conditions!). Secondly, measuring for a wheelchair is not an easy task! It’s made harder if you don’t know the language (i.e. measure the distance from the greater trochanter or tibial tuberosity to the floor. Measure the distance from C7 to the lumbosacral junction. And so on!) On top of that, trust us when we say, the more hands the better when it comes to getting everything measured in the right position! Then after a wheelchair comes, getting your dog acclimatized to it, and coming up with ways to protect the feet, or get some movement of a limb, or making adjustments to the frame to make it easier for your dog to propel itself forwards, are things we can do to make your purchase worthwhile! When it comes to wheelchairs, don’t go it alone! Here, we can make it easy for you. We don’t carry a large stock of walking harnesses. We do carry a handful. If they fit and work on your dog, that’s great! If they don’t, check out somewhere else that might have a larger selection. So, I hope this blogs helps shed some light on some of the things we do for our patients that are a bit above and beyond your typical physio, underwater treadmill, or swim sessions. As well, I’ll have to figure out how we can make this more visible within our waiting room too! If you’re ever wondering if there’s something else available for your dog, don’t hesitate to ask!